After some time of complex project work the „Hermann Schepers“ went into service with HS Schiffahrt, Haren/Ems. 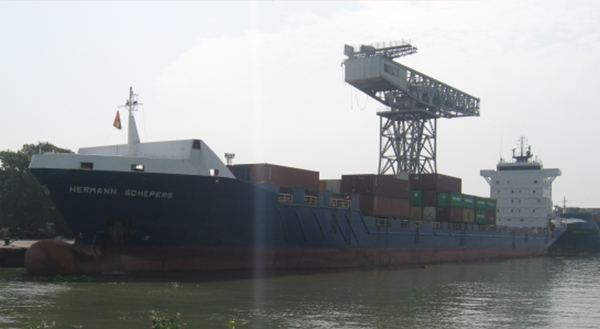 The vessel serves between India and Singapore. It was a major restructuring project. The vessel is a Container Feeder, Type Vollharding 750, built in 2003. Measurements approx 165,00 x 21,00 x 7,00 with 1025 TEU capacity, ungeared. It got restructured by beenig lengthened with a 30 meter section, which increased the container capacity by nearly 1/3. Due to the same draught of 7,00 and unchanged fuel consumption with increased transport capacity this vessel and 2 sister vessels got a long term employment in Asia.